News from Michael White and Peter Thompson at Ocean Independence that the price of their co-central agency, the 42.37m motor yacht Masquerade of Sole has been cut by a further $300,000, bringing her total price reduction over the past 12 months to almost $2 million. Masquerade of Sole was delivered by Feadship in 1983 and maintained in excellent condition with several refits, the latest being in 2007. This classic superyacht is of typical Feadship quality - solid, silent and seakindly. The sundeck Jacuzzi, an enormous main deck and a vast array of watersports equipment make her the ideal yacht for parties up to 12, with two prestigious double suites and four twin staterooms. 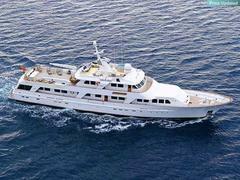 Lloyds classed and MCA compliant, Masquerade of Sole is now asking $9.25 million.